Last night, this blog went mobile. And it only took about five minutes to set up (I even threw in an iPhone version for good measure). 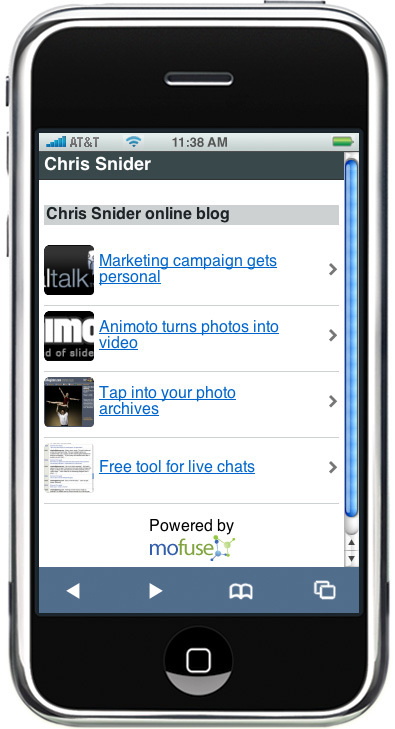 I already had an account with Mofuse, a free service that lets you create mobile sites using RSS feeds and manual links. You don’t have a whole lot of creative control, but you can choose a color palette and upload a logo for your blog. You can even pick your own little icon for your iPhone version. 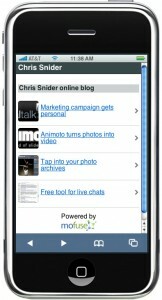 If you think you’re going to get enough traffic, you can set up mobile ads using AdMob. I’ve got a little experience with this site, having created a Des Moines-based iPhone site using whatever RSS feeds I could think to use. Overall, it’s a very simple, enjoyable experience. I’m not 100 percent pleased with how the site looks on a mobile device or iPhone, but it’s better than anything I could create on my own. For a smaller newspaper or media company, it’s an easy way to get your site on mobile devices (and even make some money off of it). For bigger sites, it’s a way to quickly create a site around an important topic (especially one that takes people away from their computers – like a hurricane). The Houston Chronicle created a mobile site during Hurricane Ike.